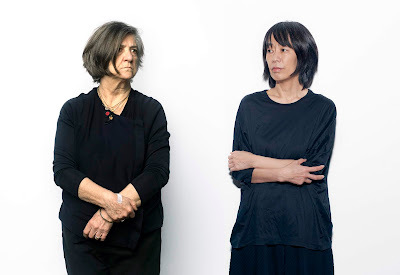 The new collaboration from Ana da Silva (The Raincoats) and Japanese punk-and-noise pioneer Phew is a record that's almost entirely not what you might expect it to be. Island, out today, is a truly adventurous exploration of textures and soundscapes that both provoke and soothe. The more-or-less title song, "Islands" coasts in on a glide of electronic washes, a glistening surface made into a composition, while the percolating "Strong Winds" sees a jittery beat roughed up by bursts of static and whirring noise. The two musicians here are both experimenting and enjoying themselves, the cuts uniformly easy to enjoy even as they push at the boundaries of what constitutes indie-pop. Elsewhere, "Bom Tempo" purrs and throbs, dark undercurrents coming to the surface, while the more playful "Konichiwa!" offers up some vocal samples and more obviously-placed beats in the service of thoroughly-enjoyable electro-pop. If album closer "Dark But Bright" suggests a more abrasive direction, thankfully Ana da Silva and Phew didn't pursue it here on Island. Out now, Island by Ana da Silva and Phew is one of the most challenging, and most enjoyable, records of this busy release schedule.